Jacqueline de Romilly was a scholar of ancient Greek language and civilization. 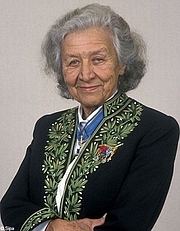 In 1988, she became only the second woman elected to the Académie Française. Sixteen years earlier, she had been the first woman appointed to a chair at the Collège de France. In addition to her works on ancient Greece, she wrote a novel, short stories, a travel book and several volumes of memoirs. Jacqueline de Romilly is currently considered a "single author." If one or more works are by a distinct, homonymous authors, go ahead and split the author. Jacqueline de Romilly is composed of 6 names. You can examine and separate out names.